This data sets contains ASTER sensor Level-1B satellite imagery over controlled burns in the State of Roraima in Northern Brazil on January 19 and 28, 2003, plus simultaneously collected soil and near-surface air temperature profiles on January 28th. The ASTER imagery is provided in 14 zipped files containing HDF-EOS files (*.hdf and *.met file pairs), while the sample-based temperature profiles, one for the air the other for the ground, are provided as comma separated ASCII files. The ASTER imagery is for one of the many fires observed by ASTER and MODIS and as reported in the related data set LBA-ECO LC-23 ASTER and MODIS Fire Data Comparison for Brazil: 2003-2004 (Morisette et al., 2007). The temperature data were collected with thermocouple sensors with Campbell data logger designed for measuring fire temperatures during the prescribed burn conducted on January 28, 2003. Figure 1 is a snapshot of ASTER L1B data taken on January 28th with the location of the thermocouple sensor shown. The ASTER high spatial resolution satellite data are available for visible-near infrared (15m resolution), short wave infrared (30m) and thermal infrared (90m) bands. Two sets of imagery were collected over Roraima state - Brazil covering a stripe of approximately 180 x 60km each on January 19 and 28, 2003. Each date has one prescribed burn and many other opportunistic fires, with simultaneous coverage of the prescribed burns by the ASTER sensor data. Data format is ASTER L1B HDF, good for opening using Research Systems Inc.'s ENVI software or other major commercial software. ASTER (Advanced Spaceborne Thermal Emission and Reflection Radiometer) is an imaging instrument flying on Terra, a satellite launched in December 1999 as part of NASA's Earth Observing System (EOS). ASTER is a cooperative effort between NASA, Japan's Ministry of Economy, Trade and Industry (METI) and Japan's Earth Remote Sensing Data Analysis Center (ERSDAC). ASTER is being used to obtain detailed maps of land surface temperature, reflectance and elevation. For additional information, visit the ASTER web site (http://asterweb.jpl.nasa.gov/index.asp). Figure 1. Snapshot of ASTER L1B data taken on January 28th 2003 (AST_L1B_003_01192003144204_03152003155855.hdf) displayed using a false color composite of VNIR bands 3N, 2 and 1 with the location of the thermocouple sensor shown. Schroeder, W. and J. T. Morisette. 2008. LBA-ECO LC-23 Vegetation Fire Data, Roraima, Brazil: 2003. Data set. Available on-line [http://daac.ornl.gov] from Oak Ridge National Laboratory Distributed Active Archive Center, Oak Ridge, Tennessee, U.S.A. doi:10.3334/ORNLDAAC/887. This data set was archived in July 2008. Users who download the data between July 2008 and June 2013 must comply with the LBA Data and Publication Policy. This data sets contains ASTER satellite imagery over controlled burns in the State of Roraima in Northern Brazil on January 19 and 28, 2003, plus simultaneously collected soil and near-surface air temperature profiles on January 28th. The temperature data were collected with thermocouple sensors with Campbell data logger designed for measuring fire temperatures during the prescribed burn conducted on January 28, 2003. The ASTER high spatial resolution satellite data are available for visible-near infrared (15m resolution), short wave infrared (30m) and thermal infrared (90m) bands. Two sets of imagery were collected over Roraima state - Brazil covering a strip of approximately 180 x 60km each on January 19 and 28, 2003. Each date has one prescribed burn and many other opportunistic fires. Data format is ASTER L1B HDF. There is a corresponding *.met file (metadata file) for each .hdf file. Though these files can be opened using any standard hdf viewer, ENVI can recognize the bands and georegistration automatically. The companion documment, ASTER_GeoRef_FINAL.pdf,gives a good description of how to georeference ASTER L1B data and to open the files in ERDAS Imagine and also older ENVI versions. The ASTER Level-1B Registered Radiance at the Sensor product contains radiometrically calibrated and geometrically co-registered data for all the channels acquired previously through the telemetry streams of the 3 different telescopes in Level-1A. This product is created by applying the radiometric calibration and geometric correction coefficients to the Level-1A data. Both intra-telescope and inter-telescope registration correction for all the bands has been accomplished relative to the reference band of each sub-system. The Level-1B radiance product offers the same number of bands at the same resolution as the Level-1A product. Level-1B data provide the input for generating higher Level-2 geophysical products. The above ground and below ground fire temperature measurements were collected with thermocouple sensors with Campbell data logger designed for measuring fire temperatures during the prescribed burn conducted on January 28, 2003. The data set covers the period 2003/01/19 to 2003/01/28. The ASTER Level-1B data set contains radiometrically calibrated DNs (in units of watts per meter2 per steradian per micrometer), quantized as 8-bit unsigned integers, for all the acquired bands. Notwithstanding the fact that the long name of an ASTER Level-1B is defined Registered Radiance at the Sensor they still only are scaled or calibrated radiances. These scaled DNs can be converted to at-sensor radiance using the Unit Conversion Coefficients (UCC) in the following manner: Radiance = (DN value - 1) * Unit Conversion Coefficient. Refer to ASTER User Handbook included as a companion file, aster_user_guide_v2.pdf, for finding appropriate Conversion Coefficients Data useful for extraction of vegetation fire radiative parameters. 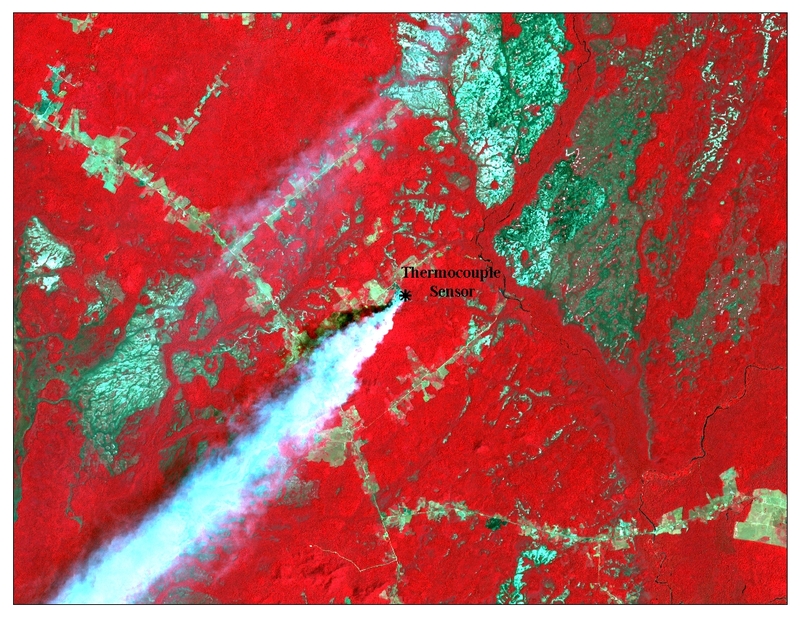 ASTER acquisition had simultaneous airborne data collection over two prescribed burns in the study area (Roraima). ASTER data is good, quality assessment report same as defined by NASA's Jet Propulsion Laboratory. Thermocouple data measurements are accurate down to decimal of a degree Celsius. ASTER imagery acquired during two prescribed burn dates. Thermocouple mounted on the prescribed burn of the 28th, above ground measurements initiated after temperatures reached 40 degrees Celsius, ending three hours after fire went through. Morisette, J. T., L. Giglio, I. Csiszar, A. Setzer, W. Schroeder, D. Morton and C. O. Justice. 2007. LBA-ECO LC-23 ASTER and MODIS Fire Data Comparison for Brazil: 2003-2004. Data set. Available on-line [http://daac.ornl.gov] from Oak Ridge National Laboratory Distributed Active Archive Center, Oak Ridge, Tennessee, U.S.A. doi:10.3334/ORNLDAAC/839.